Dad and I are just back from a week on the road. We went to Adelaide to look at our new 4WD trailer which will be ready in 8 weeks or so. It will be great for me because there's plenty of shade and places to sleep. Plus we will camp in forests and beaches and in the desert. We seem to get on even better now than we used to. We don't have to talk that much or do master/dog things. It's more that we just hang out together. I know some things really annoy Dad, like barking when the car starts or when I see a bike. But I can't stop it. I'm half cattle dog. Any way Dad should talk. He only drinks green tea from corrugated white paper cups. And always two of them. Whats that about? 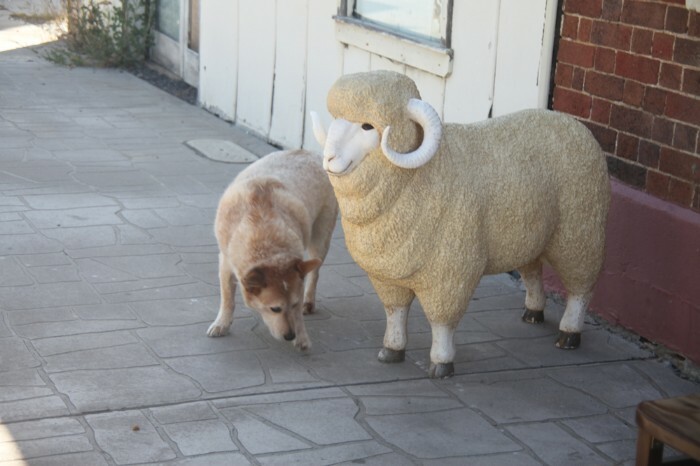 The best part of the trip was in Gunning because there were these sheep that didn't move outside a cafe. I like it when we slept by the side of the road as well. The air flows over me and brings smells all night that make me dream of chasing horses and sheep. In Adelaide we stayed at our friends Leigh and Janet's place and I played with Molly the German Shepherd. She is nice but young and frisky so I have to snarl at her sometimes. Then we came back along the Great Ocean Road. I got to surf. I am really good. I learnt when I was young when we lived near the beach. When the stick gets thrown into the water, the trick is to wait for a wave to crash and then go. Sometimes people cheer me because I catch the wave back in. Dad calls me the Surfing Dingo. We are Amooti,Dubbo and Tinkerbell and we are joyous and jealous of your new home Tommie. We are inner city dudes but we go bush as often as we can. I (Dubbo) have just had to give a statement to the dog ranger because I nipped the parking officer outside my house. I tried to tell Mum I didn't mean to but.... really I did. Hi Amooti, Dubbo and Tinkerbell. You guys sound great. What sort of dogs are you? I understand your position on the dog ranger. Why WOULDN''T you nip him. Dad has to lock the gate everyday because I do the same with the postie. Its the bike I hate. Talk soon. I think I am going to the beach this weekend. Hi Tommie You are so lucky. My mum and dad are planning to head off wiithout me. They think I don't know, but I'm smarter than they think. Hi Tommie! I reckon your new trailer sounds just the thing for canine travel. My mum's just bought a tent and we tested it out last week. I am a 2 yr old retrievador so I got a bit caught up in the zippered doorway. Why do humans have to do it like that? The good part was that I got to sleep next to her which she doesn't let me do at the house. We went to Fisherman's Bay in SA where I got to run and run on the beach without anyone giving me a hard time.